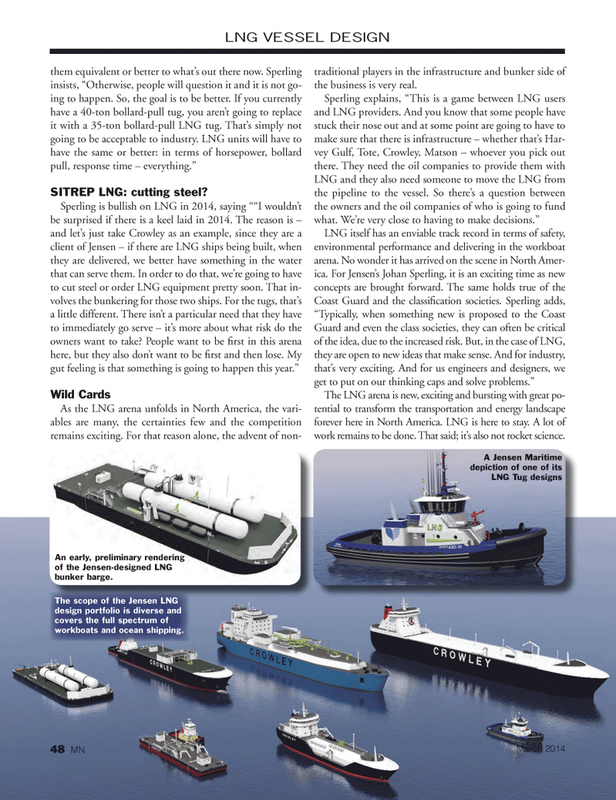 As the LNG arena unfolds in North America, the vari- ables are many, the certainties few and the competition remains exciting. For that reason alone, the advent of non- traditional players in the infrastructure and bunker side of the business is very real. The LNG arena is new, exciting and bursting with great po- tential to transform the transportation and energy landscape forever here in North America. LNG is here to stay. A lot of work remains to be done. That said; it’s also not rocket science. An early, preliminary rendering of the Jensen-designed LNG bunker barge. The scope of the Jensen LNG design portfolio is diverse and covers the full spectrum of workboats and ocean shipping.